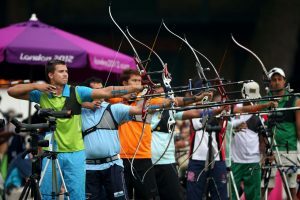 Participants partaking in this event at the Olympics will be expected to shoot a total of 72 arrows in the ranking round. They are then scored on this. Final rankings are determined by the score that was present in the defeating round. Throughout the years of the running of the Olympics, there have been many different countries that have participated. Out of all the nations, Korea has been the most impressive when it comes to consistency in top performances. This is for both the men’s and women’s events. Although archery was absent from the history of the Olympics for over fifty years, upon its return, it was adamant to be one that would stay. It has certainly grown in its popularity and it now has a conformity to its rules that is acceptable by all nations that compete. Looking back at the last Olympics for archery, there were 128 archers slated to compete. Out of these there was an equal number of men and women. The number of medals that were presented were 4 covering the men’s and women’s singles and the men’s and women’s teams. Both defending champions for the men and women were from Korea. The same was applicable to the women’s team but for the men’s team, it was Italy.